Preparedness for Life. Just Imagine. A lot of problems we have with our dogs just wouldn’t exist if stuff was constantly happening around them all the time, would it. ‘Sudden’ is the problem. Dogs’ senses are so finely tuned. In a quiet house down a cul-de-sac, a dog hearing a car door slam down the road is likely to alert and possibly to bark. The adrenalin will flow. Living on a busy London street aganst a backdrop of doors slamming, sirens and noise all the time, the dog will ignore it all. This is obvious, I know – but I would say the majority of cases I go to have an element of ‘something sudden happening’ that causes the problems. We talk of the importance of early ‘socialisation’. What is early? What is socialisation? Ideally, a puppy who is to be a family pet should start early life full of human interaction and sounds – at an age when he’s unlikely to be scared by anything – from a few days old. This requires the mother dog to be pretty bomb-proof also. Dr. Ian Dunbar, in his UK seminar in July ‘Common-Sense & Cutting-Edge Concepts in Behaviour and Training’, spoke of the importance ‘neo-natal handling’. He suggested that puppies should be gently handled by a mix of people from a few days’ old. Imagine if all breeders started bomb-proofing during the weeks before puppy goes to his or her new home. It could have amazingly far-reaching results including few returned dogs at a later date, much less need for rescues and people like me being nearly out of a job. What power! 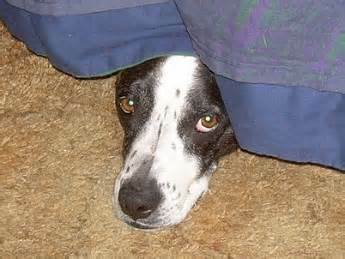 Imagine if, in addition to meeting other (gentle) dogs and people, all puppies were given regular exposure to all sorts of household appliances like washing machine, lawn mower, vacuum cleaner and hair dryers; to riding in the car; to encountering bicycles, runners and passing traffic. 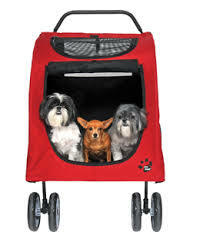 Imagine if puppies from about five weeks old were routinely walked down the street in a buggy? Taken into shops? Talked to by strangers? Meeting little children? Imagine that breeders had frequent ‘puppy parties’, inviting friends and neighbours to the house (who can take their shoes off to avoid bringing in anything that the puppies might catch)? I have Googled ‘what makes a good breeder’ and there is little mention of preparing puppies in this way before the puppies leave. It’s mostly breed-specific stuff. The stable door could be shutting and the horse could well be on the way to bolting by the time the puppy is homed at around eight weeks, certainly by the time he has finished his injections. Some dogs need more and earlier exposure than others. There has been some recent research started on the particular importance of early socialisation in certain breeds including GSDs. We need a ‘Preparedness for Life’ movement – serious bomb-proofing for puppies to make them fit for modern family life. (It goes without saying that puppies will have different personalities and genetic inheritance, and some will be more timid than others, so people need to watch really carefully for any signs of fear and stress and immediately back off to take things at the individual puppy’s pace). My German Shepherd was bought by her previous owner from a barn. She was so scared of people and the world that at just four months of age the lady couldn’t cope or ‘bond’ with her. The puppy just hid from her and would only eat or toilet when she was out of sight. It seems to me that with behaviour work, in the great majority of cases, we are trying to treat the fallout from lack of the habituation and early exposure to the life we are trying to fit our dogs into. If I had ten visitors a day to my house who were low-key with my dogs, they would hardly notice people coming and going. As it is, with maybe one caller a fortnight that comes into the house, it goes without saying that this is a major event! A while ago I got an extra push button for my doorbell which I kept in the sitting room and rang very regularly. In no time at all the dogs ignored the front doorbell. Imagine if from the start we were to walk our dogs three times a day round the nearest town. They would be immune to people, other dogs and traffic and show little excitement when the lead came out. ‘Bomb-proofing’ never ends, of course. It needs constant topping-up (I relaxed with my doorbell ringing and in a few weeks someone ringing the doorbell had them barking again). Continuous habituation and socialisation, starting very early in their life, is proved to work brilliantly with assistance dogs and it would be great if our family pets could routinely get whatever exposure they need to prepare them for their owners’ particular lifestyle. You’ll never get people choosing a puppy to consider ‘preparedness for life’ over breed, and that’s a shame. Here is the story of just one such case I went to where ‘sudden’ is causing huge problems for both dog and owner. This entry was posted in behaviour and tagged bangs, habituation, scared of people, socailzation, socialisation, socialising, sounds, sudden, sudden noises, traffic. Bookmark the permalink. 2 Responses to Preparedness for Life. Just Imagine. Excellent advice. I got my GSD pup at 12 weeks from a couple who with three young children could not cope with him. They informed me that he was showing fear reactions (park benches, bins and other objects), but did not tell me about his fear reactions to people. Worked on all this and now only has fear reactions to people on occasions. We can walk down a busy street and he will be fine – even nose people as we pass. If he sees people in places he does not expect or they appear out of nowhere he reacts, jumping and barking to get them to go away. He seems more reactive at night in places with no street lamps. Rarely, but it does happen, he will take a dislike to somebody and even two hours in their presence he will shy away from them and be wary if not overly reactive. New people coming to the house is always a problem. He barks at them for about 60 seconds but then will settle down and accept them and after two meetings they are then his friends. The initial reaction can be scary for some people. Luckily he has always loved children and other dogs. Also fine with joggers and bikes. Given this behavior – I do put it down to lack of socialization from when he was young or a bad experience. I continue to work on it, but do not have enough new visitors to work on the house thing effectively. I know it is not a normal reaction because my last shep only barked if it was somebody she knew at the door – her ear would just twitch otherwise and would be uninterested. I know it is generally unacceptable these days but I got her at 6weeks old and would carry her to do the school run etc. She was extremely well socialized and the most confident dog I have ever owned. I also dislike when people tell me he is being protective. A fear reaction is not protectiveness EVER! Appropriate protective behavior is when a teenager pushed my son and tried to take his phone. She growled and made the kid back off, then sat and watched the kid walk away. An appropriate protective behavior, which showed her confidence in dealing with the situation. Hi Claire, so much of what you say resonates with me. Getting a puppy earlier and socialising before fear period kick in is a whole lot better than leaving till 12 weeks and the opportunity is fast going. Also, fear behaviour isn’t proactive at all – it’s reactive isn’t it. Distance-increasing. I’m pleased for you that, due to your experience gained and hard work, that you now have an easy dog.